The second most often asked question from visitors to the mrlandlord.com website is, "Do you know where I can get a sample Lease on the internet?" And those that hear a MR. LANDLORD seminar always want to know, "How do I put the money making management concepts into my rental agreement?" Here's the first step. Incorporate the money-making ideas right into your rental agreement. Order this COMPLETE sample rental agreement, that includes the top 10 lease clauses that you should have in every rental agreement that will improve the performance of your residents and increase your cash flow. This sample agreement incorporates the classic and popular MRLANDLORD.com money-making management concepts and programs. 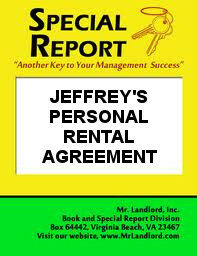 Jeffrey uses this rental agreement with his residents and the classic concepts he has incorporated into the agreement has helped thousands of rental owners monthly increase their annual net rental income by thousands of dollars and improve the performance of their residents from typical average tenant to more cooperative 3-Star residents. As many of you know, Jeffrey has both single family rentals and multi-unit properties. Jeffrey just recently updated his lease that he uses with his single family and multi-unit propeties (small & large) and he's making it available to you so that you can see and compare all his provisions. His lease, like many owners', is always a work in progress with new clauses or provisions added quarterly and some clauses removed. This lease now includes 80+ highly effective clauses that will greatly increase your monthly income plus minimize your expenses and risks plus increase the performance level of your residents. Trust me! You've got to take a look at this lease to see what clauses you may want to consider adding to your lease to dramatically reduce your headaches and expenses! Of course, we must add the disclaimer to check it with a local attorney, because many states have guidelines which include specific wording and format requirements that must be in your lease. *Please Note: While some landlords try to make their lease a document that fully protects their interest, the lease is often one-sided totally in favor of the landlord. That is not the case with Jeffrey's lease. He believes that your agreement should have provisions that benefit BOTH parties, which has helped him greatly with keeping good residents. So purposely included in this document are clauses that the resident will be able to perceive that there are benefits in the lease for them. Call our offices, 757-436-2606, and request it from Toya (customer service manager), and she will make sure we get it emailed to you right away. It will be sent as a Word document that you can easily edit or modify. ONLY THIRTY NINE BUCKS for a limited time! :) Hey for only thirty nine bucks, even all of you who own single family rentals will get 100 times the value of that price, because 95% of the rental clauses will greatly benefit you if you include some of the provisions in your lease. In fact, just one or two of these clauses is well worth far more than twenty nine bucks. There is no need for you to learn the hard way and lose hundreds of dollars before you realize you should have included a particular rental clause or two in your lease. You may just as well learn from the many school-of-hard-knock lessons Jefrey has gone through over the last 30+ years. I would dare say that many of these clauses has cost him hundreds of dollars (some even thousands) before he realized or learned he could have saved myself dearly or made FAR more rental income by simply having a particular clause in his lease, especially the new clauses that he's added from recent experiences just in the last six months alone. Click now below to order this updated ten page lease and it will be emailed to you within 24 hours. It is sent in a Word document so that you can easily edit, modify and update as needed. Or call 757-436-2606 and request it from Toya, our customer service manager. She will make sure we get it emailed to you. In case you did not know, this sample rental agreement is included as a FREE bonus as part of a GIGANTIC GOLD CLUB SUBSCRIPTION PACKAGE that includes a one year subscription to MR LANDLORD, plus 1,000 in FREE bonuses including BOTH the most comprehensive rental application (above) and this complete rental agreement.Click here for more details on the best gigantic Gold subscription package we have ever offered. We also recommend that you click here to obtain one "state-specific" rental agreement which is attorney/drafted specifically for YOUR state that you can download immediately. Other state specific rental forms are also available.